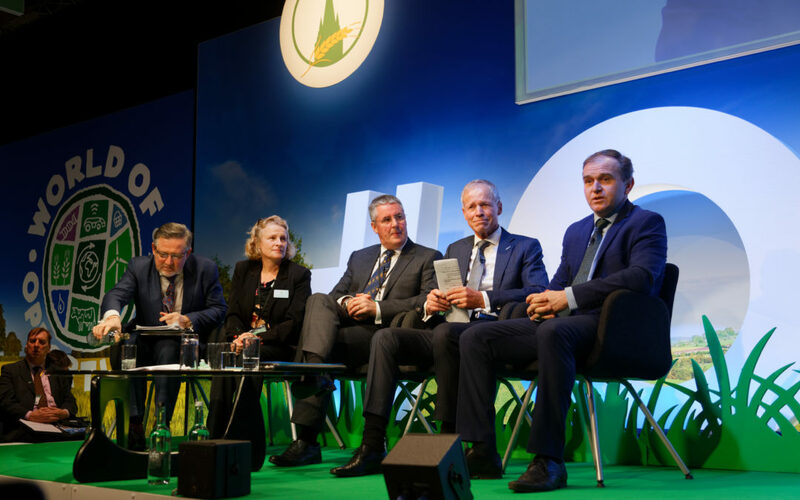 The best way for the UK government to secure a prosperous trading future for its farmers was a moot point for the four speakers in the Oxford Farming Conference’s ‘World beyond Brexit’ session. Farming minister George Eustice focused on the “lucrative” export opportunities of developing markets, as well as excluding competitors such as Irish beef and Dutch pork. Mr Eustice predicts that there will be a deal, but not the current one on the table and that there will most likely be a ‘managed approach’ come the end of March for continued trade. Labour MP Barry Gardiner showed his deep concern about the government compromising the UK’s high food standards through trade deals with nations with different tolerance levels. Referring to the US’s ‘defects allowance’, “which includes 3% of rat droppings”, the Shadow Secretary of State for International Trade and Climate Change argued that poor trade deals were not only unethical and unhealthy but will have significant economic impact. He said that being right on the border of our most important trading neighbours, the EU, they should be our focus: 44% of our exports and 53% of our trade is with the EU. Sir Lockwood Smith, former New Zealand trade minister and High Commissioner to the UK, argued that market regulation was more critical than government regulation. He cited the wine trade in New Zealand, which has thrived since subsidies were withdrawn, not because it is regulated but because it is recognised as a good product. He said that New Zealand’s sheep meat export adapted to the withdrawal of subsidies in 1989. It has the same output now with 27.5m sheep as it did with 70m sheep in 1989, driven by need and the market, Sir Lockwood said, it now makes 42 products from one lamb. In response to concern about the number of farmers that would be affected by no subsidy, Sir Lockwood said that in New Zealand only 1% of farmers went out of business when subsidies ended, and a further 4% left farming in the next few years, contrary to the prediction of one in five. With his experience of global trade, he warned against making quick, nasty deals that the UK would regret, but urged the UK to make the first bilateral deal with the European Union. Mark Clark, who runs farmer-owned cooperative Grampian Growers and is also chair of SAOS, urged collaboration and market differentiation. He believes there is a massive opportunity through cooperation and collaboration for the future, as Ireland has done with their red meat sector. He said that it’s very difficult for an upland beef or sheep farmer to have a voice, which is why cooperation is so powerful. Take the Dutch bulb growers. We know that we can compete on a global stage with some of our products, but not all. His final message was that, above all else, we must be market driven. Jane is a Chartered Marketer with over 25 years’ experience in marketing within the agri-food sector. She is a member of the executive board of the International Federation of Agricultural Journalists and the council of the British Guild of Agricultural Journalists. Jane is a graduate of the IAgrM and Scottish Enterprise Rural Leadership Programmes, is a Windsor Leadership Alumna and a Waitangi Scholar. Board member for Lantra and a Professional Agriculturalist (P.Agric).